Product tanker owners could potentially see rates improving during the second half of 2019, as a number of new refineries will hit the market. 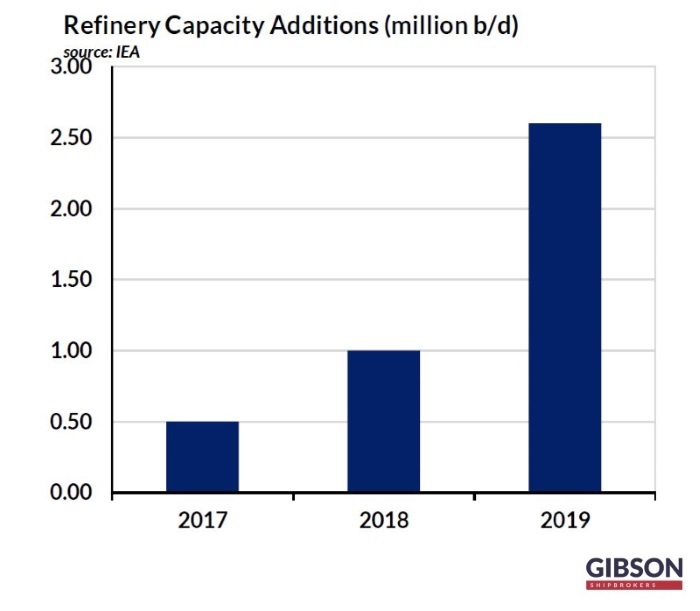 In its latest weekly report, shipbroker Gibson said that “according to a recent IEA report, 2019 is expected to see the largest wave of refinery capacity additions since the 1970’s. The Agency expects that 2.6 million b/d of new capacity will initiate operations this year. In terms of pure volumes, this is of course a bullish sign for the product tanker market, but what really matters is how global product flows shape up”. Gibson said that “Asia accounts for the bulk of the new additions. The new 400,000 b/d Hengli and Zhejiang Petrochemical plants should support higher export flows from China in 2019. Further South, Malaysia’s 300,000 b/d RAPID project, and Hengyi’s 160,000 b/d Brunei plant, as well as the recently commissioned 200,000 b/d Nghi Son Refinery in Vietnam, will all add to regional supply. Some of this supply will be gasoline focused, which could further pressure an already oversupplied global gasoline market and force more product out of the region. Where this goes however is uncertain, with main global demand centres already well supplied”. According to the shipbroker, “products supply out of the Middle East is also set to rise following capacity expansions there. Higher products supply will primarily be driven by the start up of Aramco’s 400,000 b/d Jazan refinery, increased capacity from KPC’s Clean Fuels Project and the start-up of Iran’s third 120,000 b/d Persian Gulf Star condensate splitter (although sanctions may complicate the matter). Flows into the Middle East may also be impacted. Argus estimates that the region is currently 100-200,000 b/d short of gasoline, but with the start-up of new plants this year, that deficit could drop to 50,000 b/d. All in all, this has the potential to impact on gasoline flows from the West. Likewise, the overall distillate surplus in the region is expected to grow, supporting incremental export volumes”. “Ultimately, more product will be pushed out of both the Far East and Middle East during 2019 as both regions see greater product length, with South/Latin America, Africa and Europe being the primary demand outlets for exporters. The picture is however more complicated as we move closer to 2020. As 2020 approaches, middle distillates are expected to (at least initially) serve as the primary route to compliance with the 0.5% sulphur cap. In theory higher demand and wider product imbalances should support arbitrage, particularly from East to West. However, Asia’s gasoil length is expected to be reduced through higher regional demand for low sulphur fuels, which may limit the growth in exports out of the region. This is however, expected to be counterbalanced by higher intra-regional flows, offsetting any negative impact caused by potentially lower extra-regional outflows”, Gibson said. 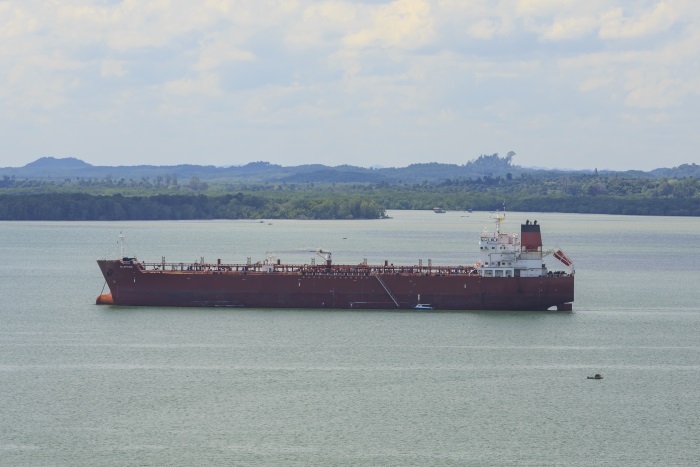 As such, “with much of the impact from new refining capacity not expected until the second half of the year, shipowners may have to endure a weak six months before seeing any sizeable demand boost. Seasonal factors will also play a role. Spring turnarounds are likely to limit product export volumes over the coming months, whilst higher newbuild volumes will continue to threaten the product tanker market. However, as we move into the second half of the year, a combination of seasonally higher flows, preparations for 2020 and the impact of new refineries coming online should be felt, allowing 2019 to end the way it started – on a high”, Gibson concluded”, Gibson concluded. 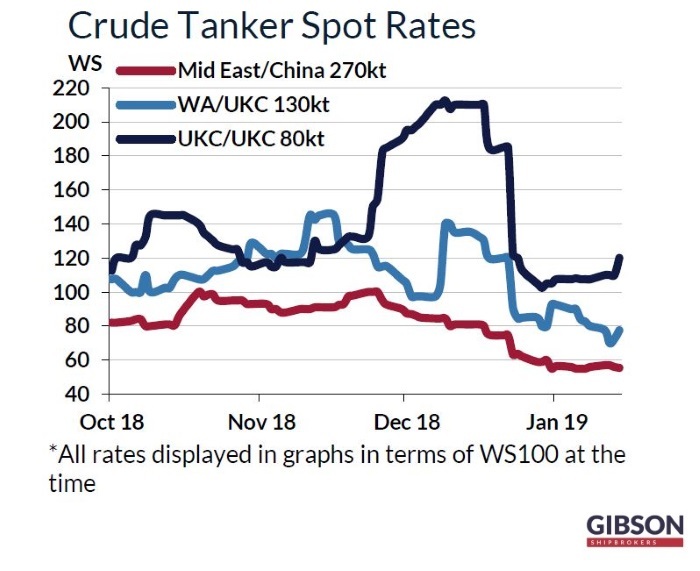 Meanwhile, in the crude tanker market this week, in the Middle East, Gibson said that “January has proved a ‘short’ month for VLCC volumes and with easy ongoing availability, and a big chunk of the February programme already taken care of, Owners started to feel the pressure. Rates remained largely rangebound, but then started to compress from the top end to end the week in the low ws 50’s East, and low ws 20’s to the West. Ballasting alternatives remain popular, but even those are starting to lose some of their previous shine. Chinese New Year approaches and Owners will be hoping for some heavier pre-Holiday fixing to help them out. Suezmaxes remained broadly flatline at around ws 85 to the East and low ws 40’s West but there were occasional premiums paid for replacements and one or two early ‘injection barrels’ liftings. Little change likely into next week. Aframaxes continued to soften to 80,000mt by ws 105 to Singapore on low-feed demand, and easy supply. Perhaps further discounting next week, but a bottom does look in near sight now”, the shipbroker concluded.